Samsung‘s and Apple‘s smartphone rivalry has bled over into the world of smartwatches – well, at least to the degree that the limited popularity of the devices allows. The Samsung Gear S3 Smartwatch has been announced by Samsung Electronics South Africa. Will Apple’s Watch series 2 be a match?. Let’s find out. Samsung Gear S3 is available in two options to suit different users’ lifestyles: frontier and classic. Inspired by the active explorer, the Gear S3 frontier blends form and function with a rugged outdoor look and feel. The Gear S3 classic pays homage to the minimalist, elegant style found in the most iconic luxury timepieces. In a quest to uncover what truly defines a watch, Samsung drew inspiration from manufacturers around the globe, paying particular attention to the craftsmanship of traditional watches. Every part, from the circular bezel to the premium finishing and buckles, has been reimagined to elicit a classic timepiece. The Gear S3 is compatible with 22mm bands so consumers can easily personalise their Gear S3. In addition to its sleek look, it offers military-level durability and for the first time on the Gear series, the Gear S3 features Corning® Gorilla® Glass SR+, which is specifically intended for wearable devices to provide a tougher, more scratch resistant and crisp display. The 16-megapixel full-color Always On Display (AOD) and Super AMOLED screen technology further differentiate the Gear S3 from other smartwatches. The AOD always shows the time rather than automatically fading to black, mimicking a luxury analogue watch. The Samsung KNOX Tizen Wearable Software Development Kit (SDK) will be available to third-parties, enabling management capabilities and the development of customised applications for Samsung’s wearable ecosystem. With the Samsung KNOX security platform, the Gear S3 will empower broader enterprise business opportunities. “Samsung continues to build on its wearables heritage of offering diverse choices to enhance consumers’ unique lifestyles. The Gear S3 puts a timeless spin on the smartwatch category by integrating advanced features and technologies with a refined design that offers convenience at the flick of the wrist. Samsung has taken smartwatches into a whole new league,” concludes Fleischer. Apple Watch 2 vs Samsung Gear S3: Which wearable should you opt for? RuBizTech brings you the major similarities and differences between the Watch 2 and the Gear S3 to help you make an informed decision on which wearable to opt for. Although both companies have more than one model, we have taken the common specifications present in all models to get a holistic view. As you can see from the specs sheet, Apple has stepped up its game by focusing on the watch’s primary use as a fitness accessory. It has added features like a heart sensor and built-in GPS to challenge wearables like Gear S3 and Fitbit that are popular among fitness enthusiasts. Its water-resistant feature of being able to sustain underwater up to 50m of depth is unlike we have seen in any smartwatch. The Apple Watch 2, however, falls behind the Gear S3 in terms of connectivity through LTE which means users can only use the Apple watch if they have their iPhone with them as there is no provision for cellular connectivity. Samsung, on the other hand, has introduced the feature for one of its Gear S3 models, the Frontier, and users need not carry around their phones if they want to operate the smart watch. Both companies have tried to include as many sensors and features as possible with Apple offering a wider range of watches under Series 2 and Samsung just two models. 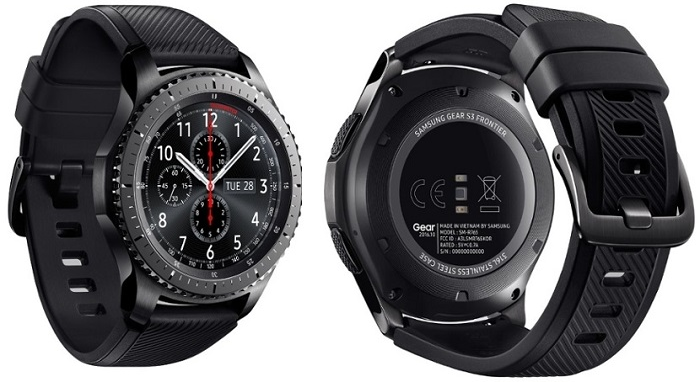 Although Apple has revealed its pricing, Samsung is yet to do so, but reports say the Gear S3 Frontier, which is the higher of the two gear models for 2016, is expected to be priced close to the Apple Watch 2 basic model. The Gear S3 will be locally available in quarter four of this year (2016).